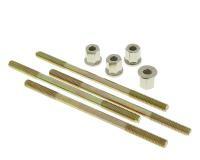 Cylinder studs including special nuts with M6 thread for securing the cylinder. Set of 4 with nuts. Length: 110mm, nuts are 13mm in length and have a collar. 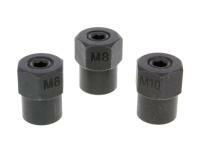 Suitable for all Piaggio engines and other models with M6 studs.